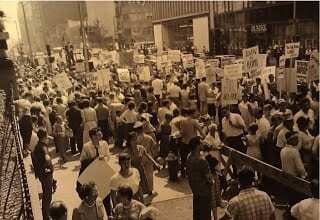 After the first protest it helped organize in 1958, SANE and its fellow peace groups took part in two regular events in New York between late 1950s and early 1960s: Hiroshima Day marches and Easter marches. Other targets of antinuclear demonstrations in the early 1960s were the Soviet Mission to the United Nations, the US Mission to the United Nations, the Soviet Embassy, and the Atomic Energy Commission office. Other events include a Women’s Peace Strike and a disarmament rally at Madison Square Garden. Another strand of antinuclear demonstration during the Fifties and Sixties centered on non-participation in the “Operation Alert” civil defense drills. The Hiroshima Day marches took place on the anniversary of the Hiroshima bombing on August 6, 1945. The first of these took place in 1958 and featured a tribute to a visiting “Hiroshima Maiden” (a woman who survived the Hiroshima bombing) Shigeko Nimoto and a march from Bryant Park to the UN. (SANE-Greater New York, 1958). 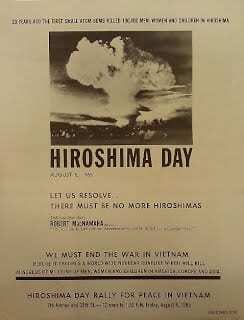 Flyer advertising the 1958 Hiroshima Day event. Starting in 1965, the Hiroshima Day marches—and the peace and antinuclear movements as a whole—began to focus more on the war in Vietnam. The slogan of the 1965 march, at 7th Ave. and 38th St., was “We must end the war in Vietnam before it becomes a world-wide nuclear conflict.” The last march for which the NYC Nuclear Archive found documentation was in 1967. 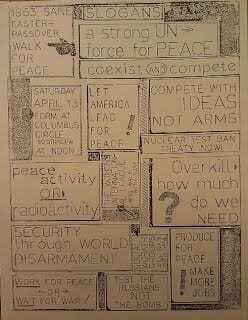 (Hiroshima Day March flyer, 1965; Robinson, 1967). 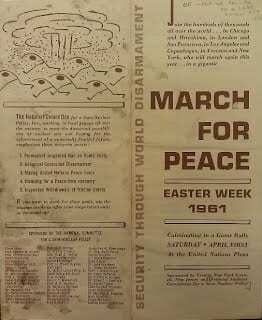 The Easter/April Mobilization marches were modeled after England’s huge Aldermaston Marches for disarmament. Six hundred people attended the first march in 1959, increasing to 3,500 in 1961, and to as many as 5,000 in 1962. Twenty-five thousand people marched nationwide in 1961, the largest anti-war demonstration since WWII, with the largest group gathered at the UN. Some demonstrators had walked over 100 miles from McGuire Air Force Base in New Jersey. 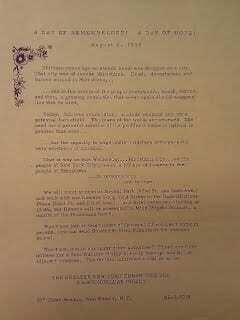 In 1962, the New York Times reports that the march was attended by “students, clergymen, writers, painters, actors, Quakers, a few beatniks and many housewives, some of whom pushed infants in carriages,” while the year before was characterized as mostly “teen-agers and college students.” Each description betrays, perhaps, a lack of respect or understanding for the movement on the part of the Times. (Clark, 1961; Katz, 1986, pp. 37-66; New York Times, 1962; Wittner, 1997, p. 259). At the Madison Square Garden Rally. 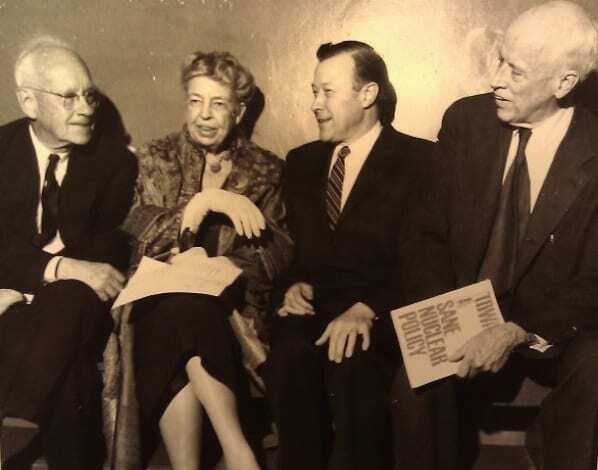 From left to right: Alf Landon, Eleanor Roosevelt, Walter Reuther, and Norman Thomas. On May 19, 1960, SANE organized a rally at Madison Square Garden attended by 17,000 people. 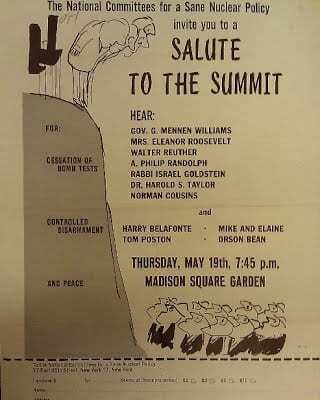 Notable guests and speakers include Eleanor Roosevelt, Alf Landon, Harry Belafonte, Elaine May, Norman Thomas, Norman Cousins, and Clarence Pickett. After the event, 5,000 people marched through Times Square to the UN. The rally was supposed to have coincided with a Premier Khrushchev-President Kennedy summit meeting, but it was cancelled after an American U-2 spy plane was shot down in Soviet airspace on May 1. (New York Tiems, 1960; Kleidman, 1993, p. 110; Norman Thomas Papers, Reel 62; Wittner, 1997, pp. 14, 246).